We blogged about Hyder before (A Ghost Town and a Grizzly, February 5, 2011). It’s an interesting town of 87 inhabitants, definitely worth the side trip if you find yourself traveling the Cassiar Highway in northern British Columbia. Go there when the chum salmon are running in late July and August, and you’ll have an excellent opportunity to view grizzlies up close from a deck overlooking Fish Creek. A hip little shop on main street, Boundary Gallery and Gifts run by Caroline Steward, features dulcimers beautifully crafted from Sitka Spruce as well as some of the best fudge we’ve ever had. There’s a hotel, a post office, a small, sparsely-stocked grocery store, a couple of RV parks and a boat launch on Portland Canal, which isn’t a canal at all but is a narrow, 71-mile long fjord separating Southeastern Alaska from British Columbia. It’s the kind of place that takes you back in time. None of the streets are paved. The residents are friendly and the ones we’ve met have been happy to while a way a piece of the day talking. Maybe the quiet, natural beauty of the place brings out easy-going attitudes. Part of the movie Insomnia (Al Pacino, Robin Williams, Hilary Swank) was filmed here in 2001. If you do go to Hyder, the one place you shouldn’t miss is The Bus. Diana and Jim Simpson came up with the idea to permanently park a school bus on one of the side streets in town and convert it into a kitchen. Jim’s the fisherman. Diana’s the cook. 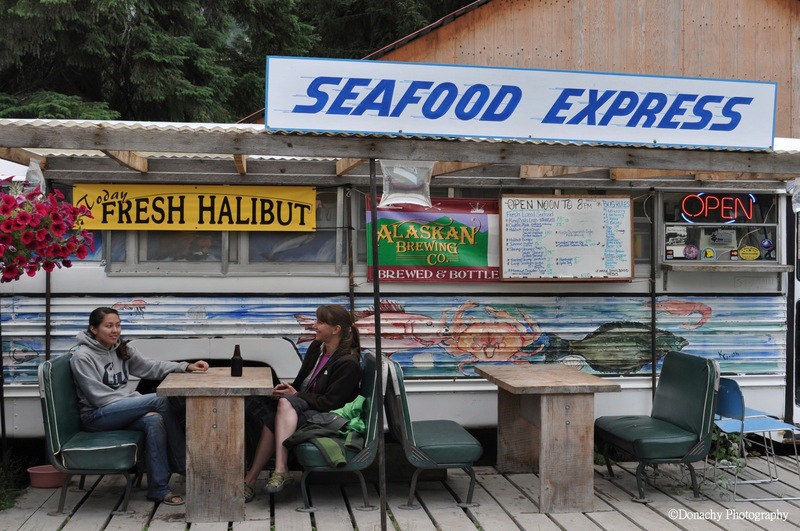 The catch of the day generally features fresh halibut and Alaska’s incredibly delicious shrimp along with salmon and other shellfish. Traveling from place to place, we’ve come across really good deep fried fish from time to time. Heck, I make pretty good deep fry myself. I don’t know exactly what Diana does, but the fare at The Bus is in a class by itself. It’s been our good fortune to dine there on two separate occasions, two different summers. Both times, our plates of fried halibut, shrimp and French fries disappeared fast and left us talking with amazement for some time afterwards. Diana also keeps icy cold Alaska Amber Ale and Alaska Summer Ale on hand – the perfect compliments to enjoying the food while Rufus Hummingbirds call back and forth from the tops of spruce trees. Thanks Carissia. We miss you too!